Los Angeles. Unnamed Press. 2015. 133 pages. 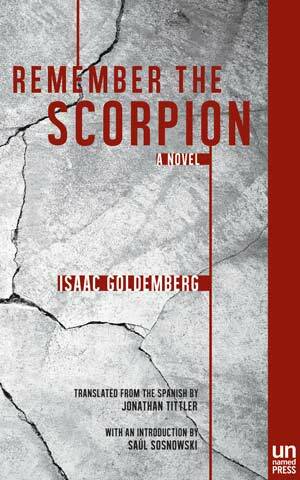 Well known for The Fragmented Life of Don Jacobo Lerner(1976), a magnificent novel about identity and belonging, Peruvian novelist Isaac Goldemberg explores the many artistic possibilities of detective fiction in his fourth novel, Remember the Scorpion. In Peruvian letters, detective fiction has a limited tradition, as compared to that of other countries such as Argentina and Mexico; nevertheless, Goldemberg’s novel overcomes such shortcomings to offer a narrative filled with suspense, melodrama, and social criticism. In May 1970, while dealing with the aftermath of one of the biggest earthquakes in Peru’s history and as the population is enthralled by the national team’s participation in a soccer World Cup, Captain Simon Weiss is charged with investigating two gruesome crimes in Lima. In the first case, a Japanese immigrant is found crucified and beheaded in a pool hall, while in the other an elderly Jewish man is found hanged in his room in a downtown hostal. In both cases, the destruction left behind by World Word II in Europe and immigrant survival in South America haunt the lives of each victim’s past. Such is also the case of Captain Weiss, a Jewish Peruvian detective who was adopted by Jewish immigrants as a boy after spending time in a German concentration camp. In fact, it is Weiss’s sense of justice that led him to a career in Peru’s police force, where he has now reached the rank of a captain and is a respected detective. Weiss at first comes across as an intelligent, courageous individual with an impeccable sense of duty to his institution. While unraveling the many intricate secrets behind these two homicides (not the least of which is the recurring image of a scorpion), Weiss must come to terms with his childhood scars and other ghosts from the past. As the narrative progresses, the reader learns of Weiss’s many human frailties—including his love for Margarita, a mestizo prostitute fifteen years his elder, his addiction to cocaine and opium, and his sentimental temperament. In many ways, such is also the case of his sidekick, Katón Kanashiro, a young lieutenant who accompanies Weiss in his fact-finding mission. Kanashiro, the son of a Japanese immigrant, is in love with Sonia Galindo, a mestizo television journalist whose reporting pretends to keep the public informed of the truth behind the two homicides. However, when the real culprits are discovered, truth (and any possible sense of justice) also becomes a questionable concept. Instead, what emerges from the narrative is a critical portrait of modern Peru as a multicultural but fragmented society where ethnic prejudices are part of the daily social dynamic and corruption permeates the highest spheres of government. 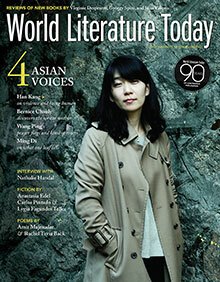 As in other works by Goldemberg, Remember the Scorpion is a novel in which national identity is confronted with personal, cultural loyalties. In the end, Weiss’s fate is the consequence of having to face his many ethical conundrums, including a questionable sense of belonging to Peruvian mainstream culture and an elusive sense of justice. Goldemberg’s excellent, fast-paced novel, well translated by Jonathan Tittler, is a reminder of this author’s great talent as a storyteller, someone whose many works deserve more critical attention.